Address: 111 Alexander Malinov Blvd. Location: Just 10 minutes from Sofia Airport and Sofia City Center on the hotel’s shuttle bus, the Holiday Inn Sofia Hotel is ideally located in the foothills of the Vitosha Mountains within close proximity of Sofia city centre. Accommodation: The hotel offers 130 tranquil spacious bedrooms, including Executive Rooms and Suites with breathtaking views of the Vitosha Mountain. All hotel rooms are en suite with separate bath and shower, and provide air-conditioning, LCD flat screen TV with wide selection of satellite channels, courtesy tray, mini bar, hairdryer, ironing board and bedroom safe. There is a comfortable work desk and high-speed wired and wireless (Wi-Fi) Internet access available throughout the hotel. Conference facilities: The Hotel’s Academy Conference Centre offers space for meetings and conferences of all sizes for 2 to 300 delegates. The hotel offers over 1,000 sq. meters of flexible meeting space throughout the self-contained conference floor, combined with the services of a dedicated Events Host. The exceptional interior designed banqueting suites accommodate functions for between 2 to 260 guests. SPA centre: Esprit Fitness & Spa facilities are the finest in Sofia with a 19m indoor Pool with separate children’s Pool, indoor and outdoor Jacuzzi, Sauna, Steam Room, large Gymnasium with Technogym equipment, Solarium and series of tranquil Treatment Rooms with range of pampering Spa treatments. 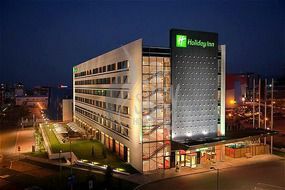 Bars and restaurants: The 5 star Holiday Inn Sofia provides a variety of gourmet dining experiences, ranging from a seasonal A la Carte menu or quality bar meals to a variety of delicious and highly popular themed lunch and dinner buffets. The Brasserie Restaurant & Terrace is one of the most modern and stylish restaurants in Sofia. The Brasserie including outdoor terrace is open throughout the day for a tranquil breakfast or romantic dinner, with views of the Vitosha Mountains and the adjacent lake. Casual but elegant, for those desiring an inventive twist on classic international and local Bulgarian dishes in an informal atmosphere. Chi Bar is the perfect venue for enjoying a quality bar meal, holding impromptu business meetings or just relaxing over an espresso or your favourite cocktail whilst listening to the hotel's talented resident pianist. Services: Secure Underground Car Parking, 24 Hour Hotel Security, Wi-Fi Internet Access throughout the Hotel, Hi-Speed Internet Access in Bedrooms, Business Centre, Laundry/Dry Cleaning Services, Concierge Services, Luggage Storage, Smoking Rooms available, 24 hour Room Service, Hairdresser. **Hotel rooms may vary in size and style. Guests can be accommodated in a different room from the images shown here as examples only.